Jazzpunk is an entertainingly absurd spy thriller parody that is confusing in the most hilarious of ways. In March, fans and developers of indie games will converge in San Francisco, California for the 16th annual Independent Games Festival. The IGF is a five day celebration of the indie gaming community that seeks to foster innovation while honoring some of the best indie games over the past year. The top prize for developers in the IGF Awards is the Seumas McNally Grand Prize. Along with $30,000, the winner of the Seumas McNally award will have the recognition of winning one of the top prizes in indie gaming and the honor of being named the best indie game of the year. Over the next few weeks GIZORAMA will be taking a look at the six games nominated for the Seumas McNally Grand Prize in anticipation of the IGF Awards taking place on March 19, 2014. First up is a brand new release from Necrophone Games: Jazzpunk. How would one describe Jazzpunk? At its core Jazzpunk is a first person adventure set in an open 3D world, but there is a lot more to it than just that. Drawing inspiration from spoof comedy films such The Naked Gun and Airplane!, Jazzpunk is a crazy, surreal journey through a stylized Cold War era cyber future where mission objectives are secondary to the desire to explore every inch of the joke and pun saturated environment. Confused yet? Well, we’re just getting started. Cold War references are just a small part of Jazzpunk‘s world. Necrophone Games describes Jazzpunk as “an adventure comedy game and poorly made word processor.” This statement is highly accurate. Is it definitely an adventure, it is certainly funny, and it isn’t a word processor at all. Therefore, as word processors go, it’s a pretty terrible attempt. This is the type of comedy you can expect from Jazzpunk. It is full of random jokes and non sequiturs that will have you laughing and groaning, often at the same time, as you make you way through the various stages. Though the humor is random, there actually is a narrative that ties the entire game together. You play as Polyblank, a secret agent who gets sent on a series of missions from your director. At a certain point one of the missions goes sideways and Polyblank has to match wits with an evil mastermind. That is the entirety of the plot. Sounds familiar, right? Kind of like you’ve seen it a thousand times before? There’s a reason for that. Jazzpunk uses familiar tropes as a foundation to build itself upon. 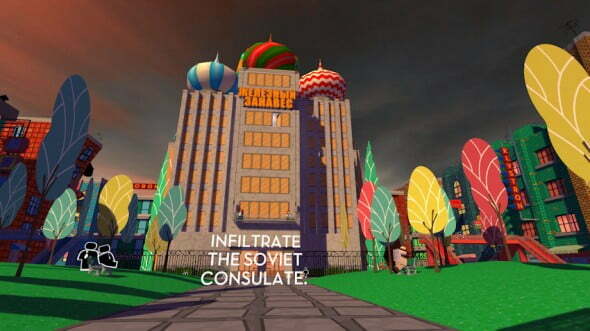 Just like The Naked Gun is a parody of police dramas, Jazzpunk is a parody of spy thrillers. Polyblank’s director issues orders from his train car office. Why? Good question. As random as Jazzpunk is, the actions needed to complete the mission objectives are surprisingly logical. You will often be told exactly what to do in order to complete the next objective. In the rare case that you do get stuck, an obvious clue offering an obvious solution is never far away. The missions themselves are only a fraction of the content in each stage though. 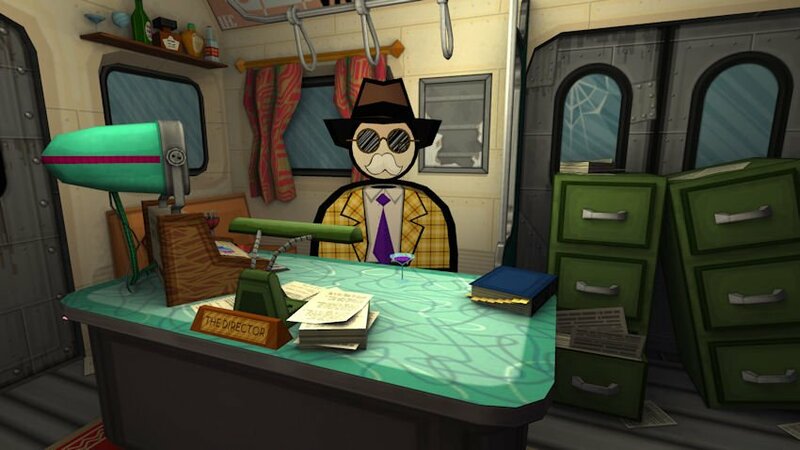 Players sticking strictly to the mission parameters will be able to speed through the entire game in under thirty minutes, but the enjoyment of Jazzpunk is not derived from completing the missions or even the game. It comes from the experience of aimlessly wandering around the game world while being assaulted by a barrage of minigames, pop culture references, and a vast amount of absurd jokes and puns. The world itself feels like it is pieced together from a variety of different influences. Think of Blade Runner if it took place in 1950s and was interpreted by Thirty Flights of Loving creator Brendon Chung. There are robots, cyborgs, and humans all living and working together and it is often hard to tell the differences between them. There is definitely a cyberpunk vibe to the game which is possibly where the “punk” in Jazzpunk comes from. Technology plays a major role in Jazzpunk and is integrated into all aspects of the game. From major plot points random side quests, Polyblank will interact with all sorts of gadgets and electronic devices in his journey around the world. Not every object Polyblank uses is technology based though. For every high-tech gadget like the Amphibian Data Visor (used to help a frog with a mohawk steal wifi so he can watch questionable material on his laptop) there is something decidedly low-tech like a flyswatter. The basic function of a flyswatter is obvious. Sure, you can use it to swat flies, but the fun is in figuring out what else you can do. Experimentation is key and is highly encouraged. You never know what kind of reaction you’ll get in Jazzpunk. Part of this experimentation that players will discover immediately is that they should investigate everything. 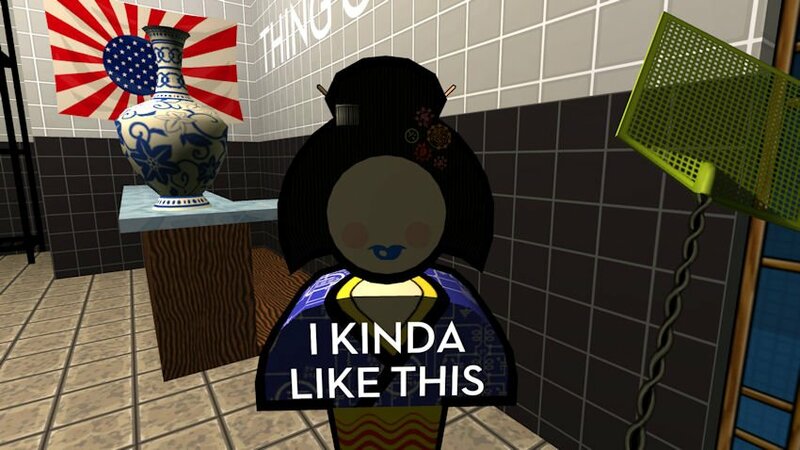 This isn’t a requirement to complete the game, but if you want to experience everything Jazzpunk has to offer then you will find yourself trying to interact with everything. Interacting with the world is simple. Besides jumping, moving, and cycling through his personal inventory, there is just one button used to do everything else in the game. The simplicity allows the player to focus on what’s happening rather than how to perform tasks. In order to break up the potential monotony of clicking on everything in sight, Jazzpunk contains a collection of minigames triggered by some of the most innocuous looking items. Sometimes you’ll find yourself slicing fruit with a sword in a game reminiscent of Fruit Ninja while other times you’ll be facing off against people in a church in a first person shooter parody of Quake. Thankfully, the quick and frequent changes in gameplay are simple and intuitive enough to be completely unobtrusive to the experience of the game. Rather than distracting the player, the variety of gameplay helps keep things interesting for gamers who might otherwise grow tired of the jokes and puns offered by much of the environment. Beneath all of the variations in gameplay, uniquely stylized open world environments, and numerous references to films and games lies the heart of Jazzpunk: the comedy. Jazzpunk is an absurdly funny game for those who enjoy farcical humor. Not once does the game take itself seriously and it encourages players to do the same. Some of the humor may elicit groans more than anything else, such as the multitude of puns, but you will find yourself laughing and shaking your head in joyous confusion a number of times throughout the game. Gamers who prefer a rigid set of rules and clear rewards in their games may want to skip Jazzpunk. Their journey will be short and shallow. For the rest of us though, Jazzpunk will provide around two to three hours of exploration and laughter which is a reward unto itself. So how would one describe Jazzpunk? Indescribably fun.